In short Mechatronics is the technology of combining electronics and mechanical engineering. Mechatronics is a multidisciplinary field of engineering that could include a combination of mechanical engineering, electronics, computer science engineering, systems engineering and control engineering . 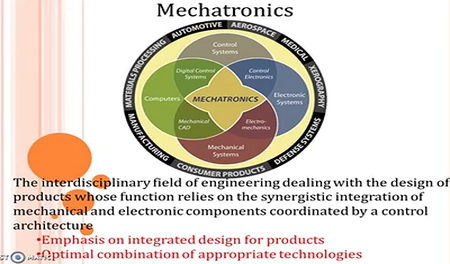 Originally, mechatronics just included the combination of mechanics and electronics, therefore the word is a combination of mecha nics and elec tronics ; however, as technical systems have become more and more complex the definition has been broadened to include more technical areas.